Ogún is the orisha of iron, tools and weapons. He is a fierce warrior and protective father. Ogún (also spelled Oggun, Ogou or Ogum) is a powerful, fierce warrior who defends his people and fights against injustice. Ogun has the intelligence and creativity to invent tools, weapons, and technology. He is the father of civilization in many ways, for it is by his strength that the path from orun (heaven) to ayé (earth) was cleared so that humanity and the orishas could come to earth. It was his tools and labor that cleared away the wilderness to build cities, homes, and roads. He is the cutting edge of the knife and as such is often misunderstood. The knife can be used to kill someone, or to save someone in surgery – such is Ogun’s nature. Ogun lives in the wilderness and forested areas of the world. He is often found hunting with his best friends Eleggua and Ochosi. Ogun can be a loyal and loving father who works tirelessly at his forge making new inventions, or he can be a blood thirsty warrior that swings machetes and decapitates his enemies. He can also be a skilled surgeon that removes cancer from the body and saves lives. At our church we honor Ogun for his protective nature, and his ability to spark ingenuity in our minds. It is interesting to note that Ogun is such a prominent orisha that the various levels of his reception mark our initiatory stages in Santeria. When you receive Ogun with the reception of the Warriors, this marks you as an aborisha – worshipper of the orishas. He begins to clear your spiritual path and helps your progress. When you undergo the ceremony of Kariocha, he goes to the person’s head and marks your elevation into priesthood. When Ogun’s diloggun are consecrated (receiving “Caracol de Ogun”) but not fed four legs, this makes Ogun complete and gives that priest the ability to sacrifice animals with his hands. This is a major step toward that olorisha being able to complete ebó on his own. Finally, when an olorisha receives Pinaldo, Ogun is given a four-legged sacrifice and his diloggun are empowered to speak fully. Ogun speaks to the initiate in itá (life reading), and the olorisha is given the authority to use the knife to sacrifice animals. This marks the olorisha’s elevation into full self-reliance. He is now an autonomous individual in Santeria and can sacrifice any animal. His orishas have been reinforced in the ceremony of Pinaldo. Just as Ogun clears the way, he marks the major milestones in our religious evolution in Santeria. Ogun, along with Eleggua, Ochosi and Osun is one of the orishas received during the reception of The Warriors (Guerreros) ininitiation. Every person will receive Ogun if they are to be a priest in Santeria. 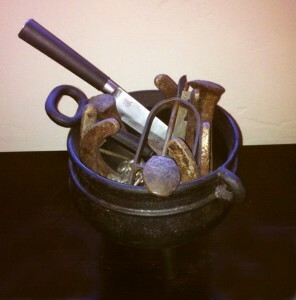 Ogun’s shrine is an iron cauldron filled with iron implements, tools, his otá and diloggún (Diloggun are received at a later time – it is not typical for any of the orishas received in the Warriors “Guerreros” to have diloggun at first). While Ogun did invent the knife, he does not own it. Obatala is the owner of the knife, but Ogun is the one that made the knife for him. Ogun’s piercing energy is vital to animal sacrifice and it is he who takes the life of the animal, not the olorisha. This is reflected in a phrase we state when performing animal sacrifice, “Ogún shoro shoro, eyebale kawo”. Translated from Lucumí, this phrase reads “Ogun speaks loudly, blood sacrifice – observe what the gods have decreed”. Ogun speaking loudly is the act of violence when anything is killed. It is Ogun that takes the life of the sacrifice. Ogun has a big appetite and will eat almost anything. He enjoys plantains, smoked fish, jutía, pomegranates, grapes, watermelons, cigars, rum, gin, bananas, he-goat, rooster, and pigeons. Below are some recipes for addimús you can prepare for Ogún. Ogún loves green plantains and there is no tastier way to prepare them than to fry them up as tostones. Get yourself three green plantains. Cut them into 1.5 inch tall cylinders. Pour about half an inch of corn oil into a skillet and bring it up to medium heat. Once the oil is hot, gently place the plantains into the corn oil and allow them to fry until they are lightly brown on all side. Remove the plantains from the oil with a slotted metal spatula and place them on a piece of brown paper bag. Fold the brown paper bag over the plantain and squash the plantain down into the shape of a coin or disk about half an inch in thickness. Turn up the heat on the oil to high and once the oil has reach the right temperature return the squashed plantains to the oil. This time fry them up until they are golden brown. Once they are done remove them from the oil and allow them to drain on paper towels to remove any excess oil. Salt the tostones to taste. Place the tostones on a plate and put a dab of palm oil on the top of each of the tostones. Place a woven mat (estera) on the ground, place Ogún’s cauldron on the mat, and place the plate of tostones next to him as an offering. Leave the offering in place as determined by divination. When the right time to remove the offering has come, dispose of the offering either in the wilderness or near a train track as determined through divination. Here is a great addimú for Ogún and it’s easy for those of you that have trouble cooking. Get a large watermelon with seeds. Cut it open and shop the red flesh into 1.5 inch cubes. Place these in a large bowl. Drizzle a generous amount of rum over the watermelon and give them a good toss so that all of the pieces are covered with rum. Allow the watermelon to sit for about 15 minutes then add a bit more rum and give it another good toss. Pick up the pieces of watermelon with a slotted spoon and place them in a serving dish. 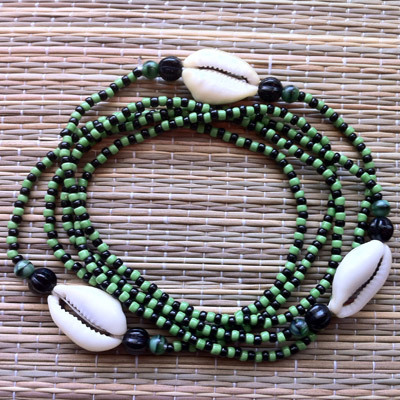 To present this to Ogun, place him on a woven grass mat (estera) on the ground and place the bowl of drunk watermelon next to him. It’s a great way to cool and placate Ogún and gain his favor. Remove the addimu when divination indicated to remove it and dispose of the watermelon either in the wilderness or near a train track as dictated through divination.